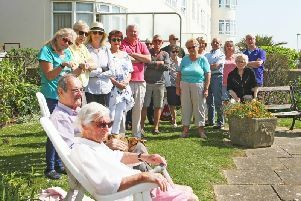 Arun District Council leader Gill Brown has repeated her insistence regeneration plans for Bognor’s Hothamton car park had ‘overwhelming’ support – but could not produce figures to support her claim. The Conservative councillor was challenged by newly-elected Marine ward Liberal Democrat Matt Stanley at his first full council meeting on Wednesday (March 7). Mr Stanley argued his election success last month – the second consecutive Lib Dem by-election victory in the town – demonstrated the ‘strength of public opinion’ against the council’s plans to turn Hothamton into a linear park. The leader said the linear park had gained support of the ‘overwhelming majority’ following consultation in October. But Mr Stanley hit back, asking if she knew how many residents constituted ‘overwhelming’. Prior to his election he spoke at a hustings event of the low number of responses and questioned how the council could claim strong support from the consultation event alone. Mrs Brown said: “Off the top of my head, no I don’t. I did attend the consultation myself and there were a lot of people there. An Arun District Council spokesman has been contacted to confirm the exact consultation figures.